Operating Engineers Local 513 apprentices and coordinators put on white hats as they rode to the rescue of the Gene Slay’s Boys’ Club to prepare the ground for a new community playground and outdoor teaching facility. 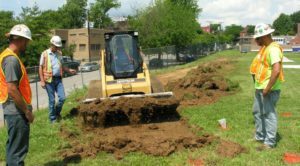 One week before the playground was to be built by hundreds of volunteers, the Boy’s Club learned that the company who originally volunteered to do the ground preparation work had to back out. An urgent call to Pat Kammer, Local 513’s business manager, brought an immediate response: “We’ll get it done,” Pat said in his usual no-nonsense, positive attitude. And get it done he did. And within 24 hours he had the manpower and equipment lined up. “Helping out is part of our union’s community responsibility that we take very seriously,” Kammer added. 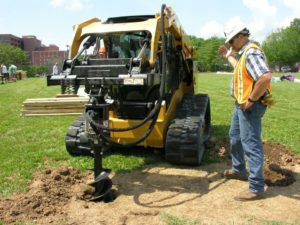 On Thursday, June 26 Local 513 showed up with five apprentices, two instructors, the program’s coordinator and two skid steers to prepare the ground for a 500-yard walkway to the site and to bore tens of dozens of post holes to anchor the structures. They returned on Friday to finish the work. Fabick Caterpillar donated one of the skid steers and the auger for drilling postholes. Local 513 provided the second skid steer that’s used in its training program. On Saturday, several hundred volunteers from Met Life Foundation and the neighborhood showed up to build the playground. Third year apprentices on the project were Jessica Moses, Jared Walker, Shawn Bodle, Len Bodle and Jay Thomas. Providing supervision were Sappington and Roger Struckhoff, and instructors Dean Grus and Dan Bottoms. The club estimated that the union saved them close to $20,000.